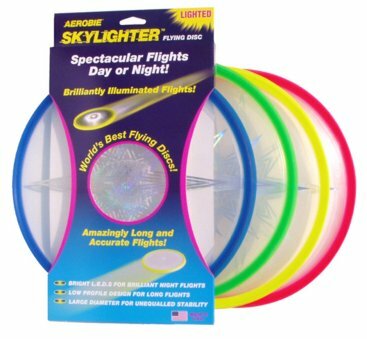 As is the case with all Aerobie discs, the Skylighter has a rubber rim that provides a performance grip for strong throws and a soft edge to catch. Weight: 175 grams. Ages 10 and up. Takes 2 lithium CR2032 3 volt batteries. Quality made in the U.S.A. 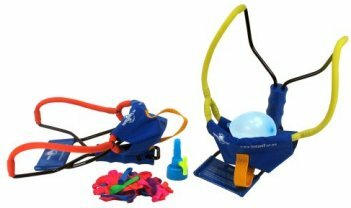 Since 1984, Aerobie brand sport toys have been known to provide exciting performance while encouraging physical activity involving skill and exercise. 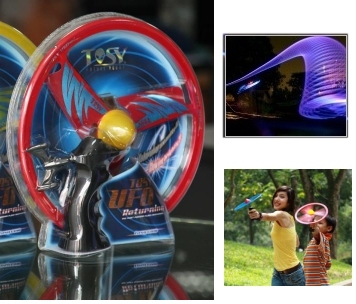 Aerobie sport toys are famous for their high performance standards. Soft edges, extreme precision and unbelievable throwing distances are the pinpoints of the Aerobie-range. The original flying ring that holds the Guinness World Record for the farthest throw! 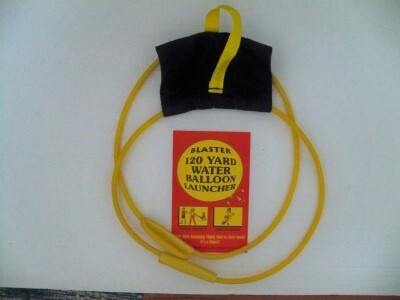 Launch water balloons up to 120 yards with one or three people. Great fun in the summertime! Water balloons sold separately. 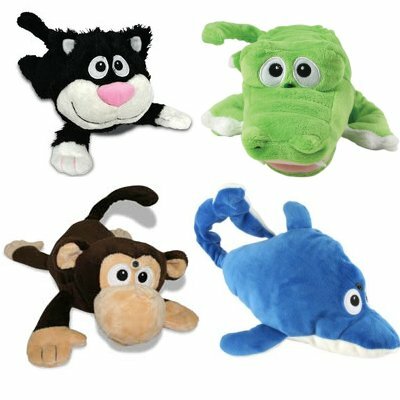 Chuckle buddies are hilarious rolling and laughing animals, that have taken the gift market by storm. The R/C Stunt Vehicle has clear wheels and a see-through top. Both the wheels and the top of the car light up as kids drive it, and the car also has different sound effects. Kids control the vehicle using the remote control's joysticks and can send the car forward and in reverse. Kids can also make the car perform different stunts, such as the acrobatic tumble, for which there are instructions on the back of the box. 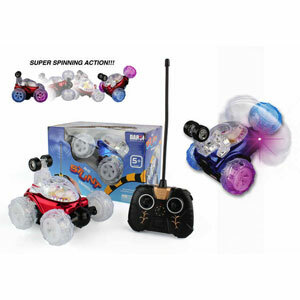 Kids can also make the car sit on its back wheels and spin its front wheels. 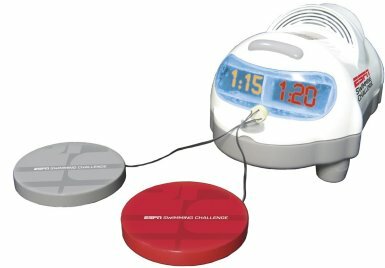 The vehicle uses four AA batteries and the controller uses two AA batteries. No batteries are included. 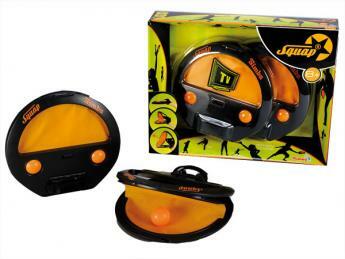 The Squap Game from Diggin Toys is the latest throw and catch craze that began with two inventors in Switzerland! 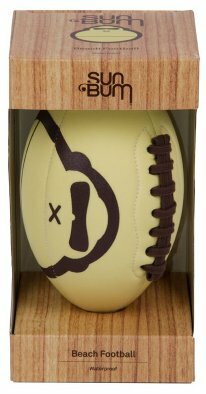 The Squap Game features "mitts" that attach to your hands with Velcro strapsâ€”snap it open to launch a ball then snap it shut to catch again! The Squap Game comes with 2 Squap mitts and 4 balls. Great for the park, beach, or backyard. 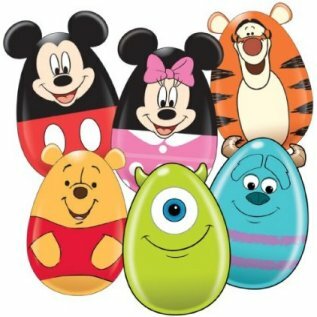 Fun for your kids or the whole family! The Fun Fly Stick Magic Levitation Wand: As close to genuine magic as you can get! All the would-be wizards out there can enjoy a magic wand of sorts that's simply mesmerizing. The wand emits static charge using patented technology which allows users to levitate the tinsel flying toys included with the wand just by pressing a button. Once aloft, levitating toy shapes can be directed by the user in any direction giving kids a tangible lesson in the power of static electricity and the repulsion of the like charges. The Fun-Fly-Stick wand uses no air, strings, or magnets. FunFlyStick is a portable, encapsulated Van de Graaff generator that begins separating electrons and protons at a press of a button. A positive static charge gets accumulated on the cardboard control tube. The special precut shapes (flying toys or flyers) are able to receive the static charge off the wand on contact. The charge gets distributed along the entire surface of the flyer and due to the repulsion of the like charges the flyer expands within itself. The parts of the shape repel each other creating visual impression of the instantly expanding shape. The flyer also repels from the wand, so by moving the wand below the flyer, you can keep it floating in the air. Touching the floating flyer with a hand causes instant static discharge and the flyer collapses into a pile of tinsel. Touching it again with the wand will bring the flyer â€œinto lifeâ€� as if by magic. When the flyers are in the air they can be controlled by the charged wand and stirred from side to side. Various â€œmagicâ€� tricks that can be performed with the Fun-Fly-Stick and the flying shapes are described in the brochure included with the wand. Requires 2 AA batteries (not included). 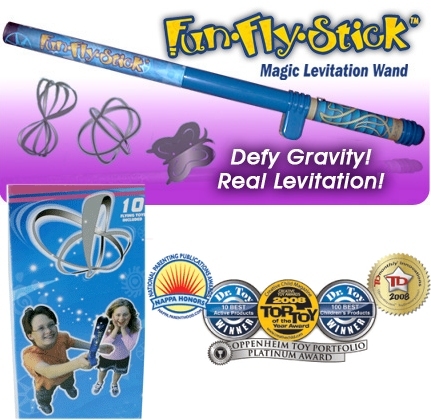 Includes 10 flying toys, FunFlyStick Magic Levitation Wand, and Magic Wand manual. For ages 5-105. 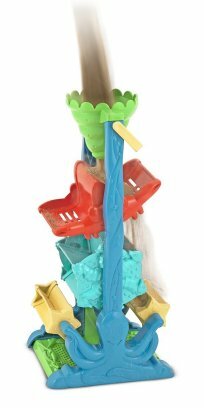 Made by Unitech Toys, Inc.
Pour water or sand through this whimsical tower of sea creatures, then watch as the different layers funnel, tip, spin and sift. Made of sturdy plastic in a rainbow of bright, fade-resistant colors, Funnel Fun is perfect for outdoor play. With a convenient carry handle, it's easy to bring it along to the beach or backyard. 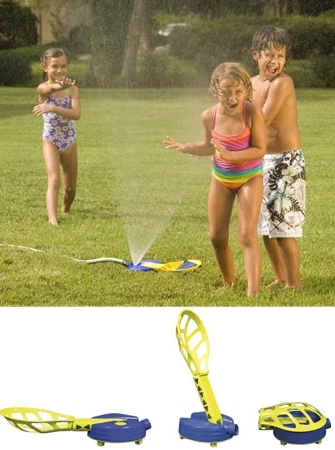 A booming success with kids of all ages, the Marshmallow Blaster shoots large marshmallows 30-40 feet on a line. In the world of marshmallow warfare, the Blaster is one of the key weapons of marsh destruction. This single-action, lock-and-load unit fires one marshmallow at a time â€“ then itâ€™s time to lock and reload and continue having a blast!Â Ages 6 and up. See if youâ€™re the modern-day William Tell with the highly accurate Marshmallow Bow & Mallow. Snap-action fun for all ages, the Bow & Mallow shoots at a range of up to 30 feet and holds 25 miniature marshmallows in one magazine for soft, non-stop fun. How do you like them apples â€“ errr, marshmallows? Ages 6 and up. Sweet victory! The original Marshmallow Shooter has pump-action rapid fire that shoots mini marshmallows over 30 feet. The easy-to-refill magazine holds 25 mini marshmallows for non-stop action.Â Ages 6 and up. 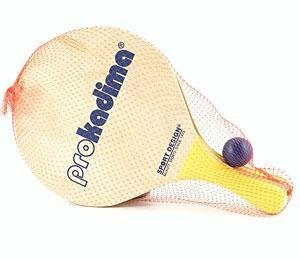 Smash Ball/Pro Kadima. The orginal beach paddle with ball. 2 wooden paddles and one ball. This is the classic beach game. Like tennis in the sand. A Beach favorite since 1975. Paddles measure 16 in length. Specially designed low resilience balls. High visibility colors. Ideal for beach or lawn play. RingStix is a simple and innovative variation of the most common game in everyone's childhood, catch. It uses two Stix shaped like inverted swords to propel a ring at ones partner, who catches the ring and throws it back using his Stix. The game is easy to learn and can be played from 30 yards away. Hours of fun awaits you with this awesome game. Each game contains a full set for two players: 4 Stix (orange, green purple and blue) & 1 Red Ring. 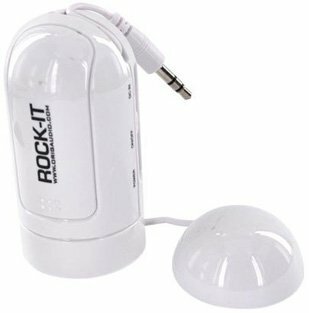 Rock-It is an awesome little accessory that takes the music from your audio devices and turns it into vibrations. You can then stick it onto any object to turn it into a speaker! So if you are on a trip and want to share your music, take literally anything you can find such as a cereal box or a cup, stick it on it and enjoy the music! Watch the video to see the full extent of this little wonder. This nine-piece sand-play set lets young pizza chefs to turn a pile of sand into endless pizza creations! 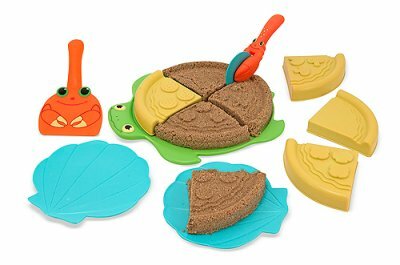 Four sand molds make different play-food toppings--cheese, mushrooms, peppers or pepperoni--to mix and match for custom slices. The set also includes a turtle-shaped pizza tray, two shell plates, a rolling pizza cutter and a crab spatula to lift out each amazing slice. Great for motor skills and pretend play! The Super Ball made its big bounce into the world in 1965. This curiously bouncy ball was invented by Norm Stingley, a chemical engineer employed by the Bettis Rubber Company in Whittier, California. Stingley fashioned a ball of Zectron, which is a material originally intended to cap off gushing oil wells. 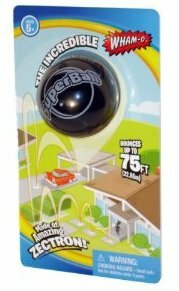 He placed the molded Zectron ball under intense pressure; the result was the ball could bounce 6 times higher and more energetically than any regular rubber ball. Stingley sold his brilliant Super Ball concept to us and we were very excited to share it with the world! Our company sold 6 million Super Balls the first year it was marketed. By the mid-1970s, sales of the novelty had dwindled, but in 1998, we released "The Original Super Ball," with much nostalgic appeal to its fans. 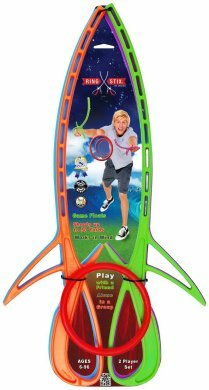 TOSY AFO Aliens Flying Object toy is a boomerang that returns exactly from where it was thrown, is safe and easy to use, and can be played with indoors or outdoors. Its flexible thin blades are adjustable and allow it to stay aloft for a long time and return exactly from where it was thrown. Plus it has LED lights that give it great special effects! Smart super bright LEDs automatically turn on when flying, creating a bright colorful rainbow at night. Can be easily launched with its special launcher. 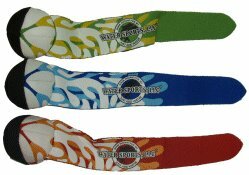 Adjustable blades that help you launch the TOSY AFO to a desired height. Safe even in small spaces both indoors and outdoors. Inside, the AFO can be spun on the floor, against the wall and even hover at the ceiling! The Waboba Pro water ball is this summer's hottest water game for the beach, pool, lake or pond. Seriously, throwing a tennis ball or a frisbee while standing in water isnâ€™t all that fun. So why not invent something that bounces on water, like a skipping stone that you can catch? And if that is possible, why not invent a game that is fun and challenging but can be played with just the ball, no goals, nothing extra - just the ball? 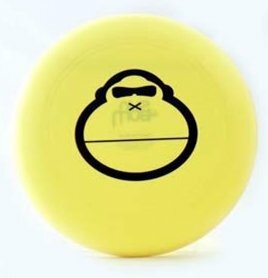 The Waboba Pro water ball has been made with the official game in mind. 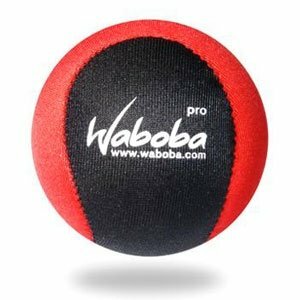 The Waboba Pro Ball is made of polymere gel and has a elastan coating..it is more stable than the Waboba Extreme, making calculating the direction of the bounce easier. The mix of different gels makes the ball bounce and float on water. The Waboba Pro water ball is heavier and larger than the Extreme model...making it more accurate. The Waboba Pro water ball is made to endure some rough handling, but do not bounce it on the ground or on walls etc. 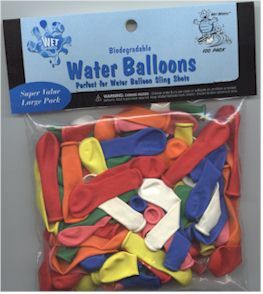 Draw back the water sling and let your balloon fly. 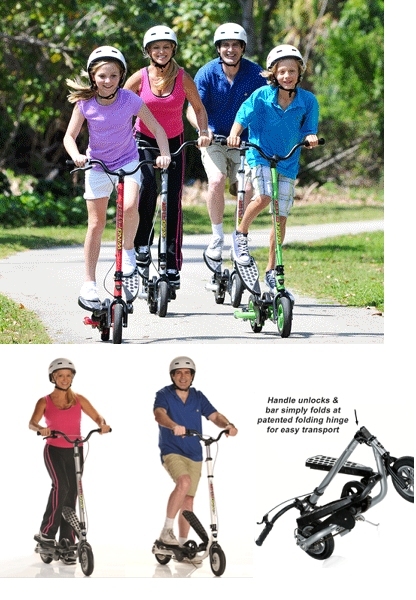 A cross between a Stairmaster and a scooter, the new WingFlyer stepper scooter provides a great workout while cruising the neighborhood or park. The WingFlyer is very easy to use. Simply place one foot on the lowest pedal, push off the ground once or twice with the other foot, and begin to pedal. The faster you pedal, the smoother your flight! Gently squeeze the right hand control to active your brakes when needed. Great fun for the whole family. Folds into a compact package that you can transport easily in your car.